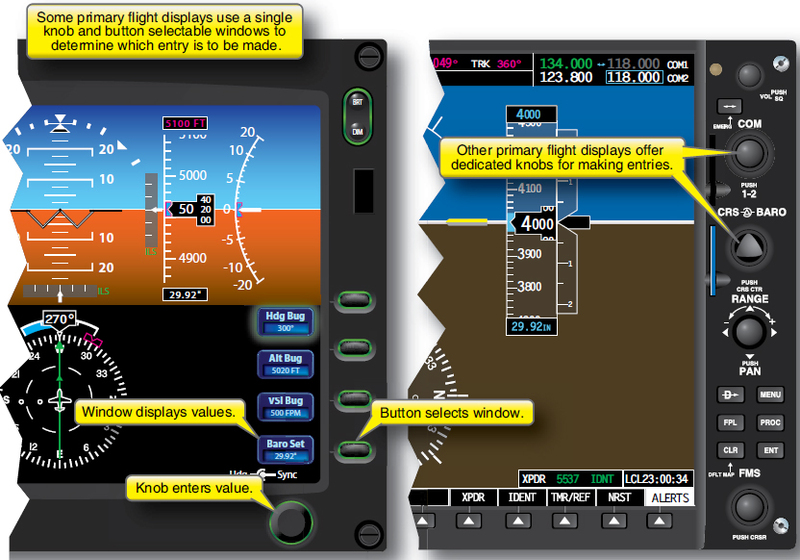 An important feature of the PFD is its ability to gather information from other aircraft systems and present it to the pilot in the integrated display. For example, the PFD in Figure 2-5 presents many useful items about the status of the flight. The top bar shows the next waypoint in the planned flight route, the distance and bearing to the waypoint, and the current ground track. The outside air temperature (OAT) is shown in the lower left corner of the display. The transponder code and status are shown with the current time in the lower right corner. This PFD also allows the pilot to tune and identify communication and navigation radio frequencies at the top of the display. Figure 2-5. PFD flight status items. PFDs have evolved and have become more than flight displays in many cases. The amount of data available for display can overwhelm the pilot with data. Therefore, many manufacturers have integrated data control and display controls into the display unit itself, usually around the perimeter of the unit. These data and display controls provide different ways of selecting necessary information, such as altimeter settings, radials, and courses. Figure 2-6 illustrates two different kinds of controls for making entries on primary flight displays. Some PFDs utilize a single knob and button-selectable windows to determine which entry is to be made. Other PFDs offer dedicated knobs for making entries; quantities are sometimes entered in one location and displayed in another. Still other units retain all controls on a separate control panel in the console or on the instrument panel. Figure 2-6. Making entries on a PFD. The competent pilot is familiar with the behavior of each instrument system when failures occur, and is able to recognize failure indications when they appear on the primary flight display. Manufacturers typically use a bold red “X” over, or in place of, the inoperative instruments and provide annunciator messages about failed systems. It is the pilot’s job to interpret how this information impacts the flight. 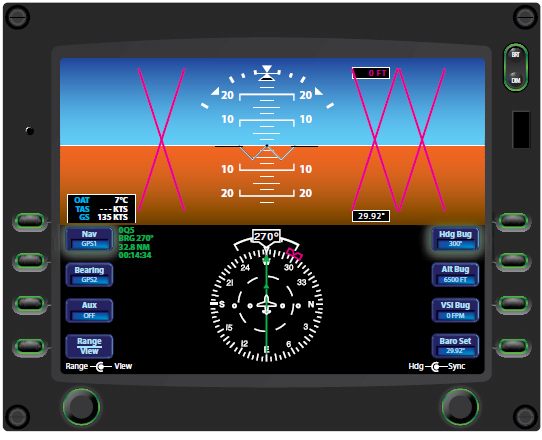 The inoperative airspeed, altitude, and vertical speed indicators on the PFD in Figure 2-7 indicate the failure of the air data computer. As do all electronic flight displays, navigation units (area navigation (RNAV)/flight management systems (FMS)) and instrumentation sensors rely on steady, uninterrupted power sources of 24 VDC or 12 VDC power. Any interruptions in the power supplies, such as alternator/ regulator failure, drive belt failure, lightning strikes, wiring harness problems, or other electrical failures, can completely disrupt the systems, leading to erratic indications or completely inoperative units. Especially in standard category aircraft not designed or built with the redundancy inherent in transport category aircraft, a proficient and prudent pilot plans for failures and has alternate plans and procedures readily available. Figure 2-7. A PFD indicating a failed air data computer. 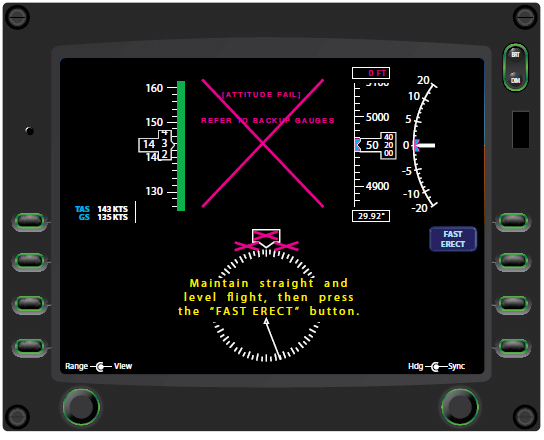 The inoperative attitude indicator on the PFD in Figure 2-8 indicates the failure of the AHRS. By understanding which flight instruments are supported by which underlying systems (e.g., ADC, attitude heading reference system (AHRS)), you can quickly understand the source of a failure. It is important to be thoroughly familiar with the operation of the systems and the abnormal/emergency procedures in the pilot’s operating handbook (POH), aircraft flight manual (AFM), or avionics guides. Figure 2-8. A PFD indicating a failed AHRS. The PFD itself can also fail. As a first line of defense, some systems offer the reversion capability to display the PFD data on the multi-function display (MFD) in the event of a PFD failure. Every aircraft equipped with electronic flight instruments must also contain a minimal set of backup/standby instruments. Usually conventional “round dial instruments,” they typically include an attitude indicator, an airspeed indicator, and an altimeter. Pilots with previous experience in conventional cockpits must maintain proficiency with these instruments; those who have experience only in advanced cockpits must be sure to acquire and maintain proficiency with conventional instruments. Because any aircraft system can fail, your regular proficiency flying should include practice in using the backup/standby instrumentation in your aircraft. The backup/standby instrument packages in technically advanced aircraft pro vide considerably more information than the “needle, ball, and airspeed” indications for partial panel work in aircraft with conventional instrumentation. Even so, the loss of primary instrumentation creates a distraction that can increase the risk of the flight. As in the case of a vacuum failure, the wise pilot treats the loss of PFD data as a reason to land as soon as practicable. 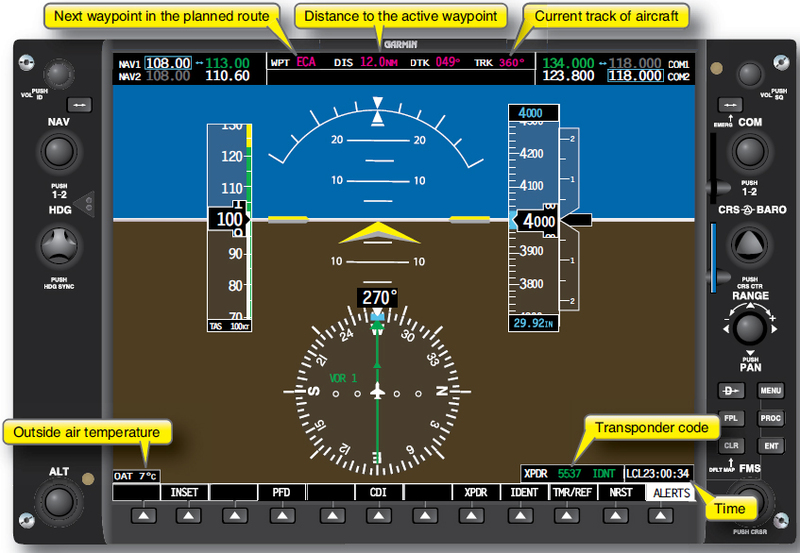 Correctly interpret flight and navigation instrument information displayed on the PFD. Determine what “fail down” modes are installed and available. Recognize and compensate appropriately for failures of the PFD and supporting instrument systems. Accurately determine system options installed and actions necessary for functions, data entry and retrieval. Know how to select essential presentation modes, flight modes, communication and navigation modes, and methods mode selection, as well as cancellation. Be able to determine extent of failures and reliable information remaining available, to include procedures for restoring function(s) or moving displays to the MFD or other display.